Concierge Auctions is a New York-based real estate auction company offering a smart and efficient way to buy and sell the world’s most unique, high-end properties. Operating since 2008, they have helped sell over a half-billion dollars in luxury real estate worldwide. With an aggressive expansion plan, Concierge required more from their website presence in conjunction with their inbound marketing efforts. The new Concierge website had to be representative of the high-quality auction process. Not only did Concierge need a more modern user interface but also sufficient visual space to showcase each unique property that has an average listing price of $5.4 million. Since each buyer, seller, bidder, and agent was essential to their business growth, their website needed to be a lead generator in all of these categories. 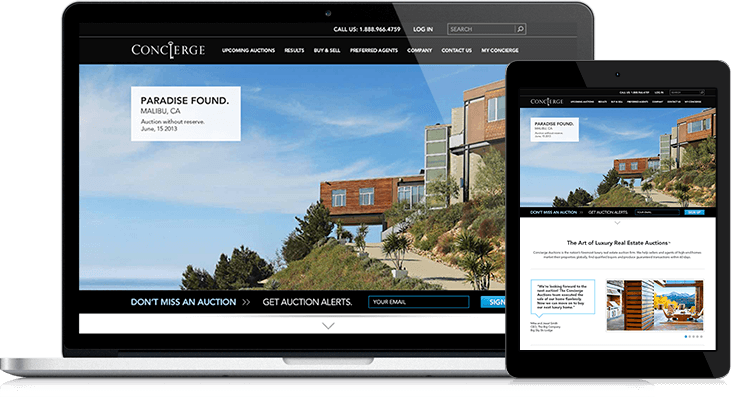 Concierge Auctions' audience ranges from real estate agents looking for a fast selling solution, to homeowners looking to bid on a second or third home. The expectations of these users are high. Buyers are tech-savvy and value a high-quality web experience. The old Concierge Auctions website lacked a modern user experience and fell flat in representing unique properties for auction. It also didn’t capture the youthful, vibrant culture of the Concierge team. The old CMS limited their ability to regularly optimize pages for conversion and keep their web content fresh. Several key pages were also missing basic on-page SEO components, thus stifling the organic growth for every property listing posted. With an old, flat, stale design it was hard for Concierge to convince prospects that they offered the absolute best solution for marketing and selling a luxury home. The team at Concierge Auctions went through months of meticulous website planning before approaching us. They knew the website needed to generate leads to strengthen the relationships with sellers and agents who rely on a large pool of bidders on auction day. They knew they wanted to integrate with HubSpot and work on an easy-to-use platform that offered a single place to manage website content and quickly post new property listings. Matching the site’s need for ease of use, having a design team that can create an eye-popping design that brought luxury homes to life online and wow the potential buyers was vital to the success of the business. Concierge engaged us with this complex challenge, positioning their company at the top of their game and as a leader in their industry.